"The moon is at her crystal window, spinning and weaving." We've been perplexed for a long time about how to depict a simple arctic moon, such as the ones we've seen painted on Native American cedar boxes...It finally came to us! Inset a Rare Blue Fossil Walrus Ivory piece into a light-colored background! 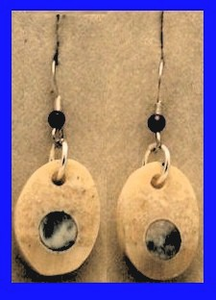 It works wonderfully in these Arctic Moon Earrings! They give the impression of a full moon in an immense sky - just as if you were looking at the moon above the arctic circle. Sterling Silver French earwires hold a purple amethyst bead above our inlay earrings. 1 1/4 inch high, 9/16 inch wide.